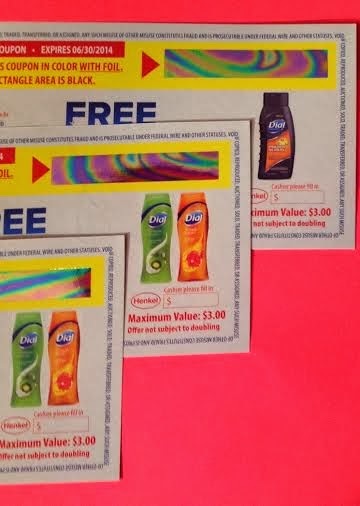 I'm a Purex Insider, and recently I was sent a bottle of Dial Vitamin Boost body wash to try. I liked it. First off, I just liked the look of it. So many body washes are clear, and I enjoyed the green color of this one. (And I have a feeling I'll use the right amount. Since I don't wear my glasses in the shower, colorless body washes have a tendancy to overfill my scrubbie because I can't see how much I have on there!) Secondly, it left my skin smooth and soft. My boyfriend has really dry skin, and I asked him to try it out for a second opinion. He said it had a nice smell, so this is a body wash that could be used by the whole family since it doesn't have a feminine scent to it. (I do like how it smells, it's just not a girly scent. It's a clean, refreshing scent.) It's infused with Vitamin B to give your skin a nice softness after using it. How would you like to win TWO coupons for Dial Vitamin Boost body wash AND a coupon for a Dial men's body wash? Just enter on the Rafflecopter below. Open to the USA only. Must be 18 or older, ends February 16 at 11:59 and winner has 48 hours to contact me or I'll chose another winner. i wanna try this because i love dial! I love great smelling shower washes! I'd love to win so that I could give this a try! I always use Dial and would love to try this body wash. I wanna win because I am smelly and I need body wash! I would like to win because I use Dial, and I am almost out. I would like to win so I can try it. I like Dial soap and would like to try the body wash. I've never tried this so it would be nice to try something new. I would like to win because I love body wash! I would love to win because I use Dial products all the time and would love to try these new body washes! I love trying new bath products, and I'm a fan of Dial. I want to win because I love the pink himalayan dial wash. I want to try a new bath wash and some new scents. I'd like to try this because I really like Dial body washes. I've been using the coconut water body wash from Dial for the last year or so and I love it! I would love to try this because I have heard such great reviews recently! I'm outta soap! What great timing! I would like to try this. Dial is the only thing we use in our home! Love Dial! I'd love to win because we only use Dial & my Husband is an underground miner so we go through a lot of body wash! I've been looking for a new body wash! I love the Dial body washes already so I know this will be a great bodywash! This product could be used by my whole family. All 3 generations of us! I would love to win so I can keep my family Dial clean! Glad you entered this at the EarnestParenting.com giveaway linky page! I been an avid fan of Dial for years. I would really like to try Dial Vitamin Boost Body Wash. The winter weather has dried out my skin so it can use a Vitamin Boost from Dial. I want to win because my dry winter skin could use some B vitamin infused softness. I only use gels or liquid soap for showers and it goes fast around here so I would love to win and try these Dial products. You can never have enough body wash. I want to win because dial makes great products. Dial is a product we like and we really really like free with our budget. I would love to win the coupons for the Dial Vitamin Boost body wash as well as the Men's body wash because I love that they are lotion infused for softer skin. Winter time always does a number on my skin as well as my husband's. I love the smell of Dial and how refreshingly clean I feel. I love the Vitamin Boost body wash and want more!! With 3 sons & a large man child, Dial Body Wash would work out great for us! I want to win because I love Dial body wash! I like Dial washes and haven't tried the vitamin boost yet, I would love to get one for my guy as well! I would love to try this because I have very dry skin. Because it's rare to see men's products on these giveaways and I'd like to try it. I want to win because I love dial products and would love to try the vitamin boost. I would love to win this as I love Dial Body Washes! I want this to try it out. I want to win so I can try out the new vitamin boost products. My hubby and son love dial products and we are always up to trying something new. Thus, we would love to win. I'd like to use this on my dry skin. I like Dial products. I use the body wash. I would like to win so I can try the product out.......... and my husband would love it ! i would like to win to try this scent/added vitamins. i usually use Suave but this looks of higher quality. I would like to win. Being infused with vitamins should help my wife's dry skin. I would love to win this to help with my dry winter skin. id love to win because I love to try new products! Im always looking for a new favorite thing! Thanks for the giveaway…would like to try the Dial men's body wash ! I have been hoping to find a new bodywash to try and have not tried this one yet!